We are one body in Christ, sent in faith to share God's Love, through Worship, Service, Fellowship and Witness. Lent - a season of observing Jesus' journey to Jerusalem and reflecting on our own journey in this life. Like Jerusalem we are unwilling, but by our identity rooted in our baptism and as followers of Jesus Christ we can think and act differently in this world. We can lead with love and compassion to dispel hate and violence. I invite you all to participate in the season of Lent - Mid-Week Meal (6PM) and Worship (7PM) on Wednesdays, March 13-April 10; Maundy Thursday Worship, Noon and 7PM; Good Friday Worship, Noon and 7PM. This Sunday, the 24 th we will be welcoming new members to HLC. Those being welcomed are Scott & Amanda Brown, Sierra and Kaylee, Judy Prater, Beth Noren, Kayla and Kallie, and Storm Britton-Ilouno. Mar 24, this Sunday, we will continue to discuss Rob Bell's "What is the Bible?" . This is a very good read and will undoubtedly produce some great discussion. Books will be provided. This group meets at 9 AM for an hour Sunday mornings. Please join us for this time. We will be discussing chapters 31-35 this Sunday. Saturday, April 6 th will be our annual Cemetery Clean Up Day from 8 til noon. This is a Thrivent sponsored event. A light lunch will follow. For more information, contact David Dahl or Donna Fowler. Saturday, April 13 th will be our Church Property Clean Up Day from 8 til noon. General trimming and cleaning of flower beds. Please bring your favorite gardening tools and gloves. This is also Feeding the 5,000 day, so breakfast will be provided. Your help in sprucing up the property for Palm Sunday and Easter is appreciated. 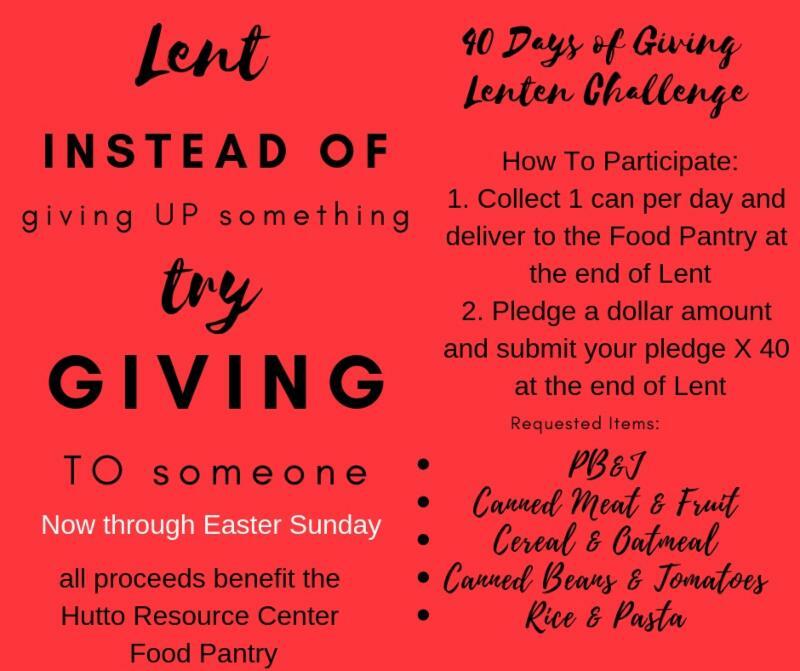 Instead of GIVING UP something for Lent, GIVE TO SOMEONE! Pledge a dollar amount each day and submit your pledge X 40 at the end of Lent. Collection will take place during the 40 days of Lent, beginning Ash Wednesday, March 6 th thru Easter, April 21 st . Interested in Becoming a Member of Hutto Lutheran? New Member reception Sunday will be March 24. Potluck on March 24th will be a time to introduce our new members. Please contact Vicar Katie if interested. March 31 - Discuss ' The Horse and His Boy' during the morning hour and watch the movie after Worship. April 14 - Discuss ' Magicians Nephew '. May 5 - Discuss ' The Last Battle '. Will be on hiatus until after Easter. Our next meeting will be Wednesday May 1 st in the Fellowship Hall. Meeting time is from 6:30 until 7:30 PM. Our monthly meeting will be Tuesday April 16 th in the Fellowship Hall at 11:30. Will be on hiatus during the Lent. Our next meeting will be Wednesday April 24 th at the Downtown Hall of Fame. Will be on hiatus for the next 2 months during Lent. We will resume in May. Ladies, our next Bible study will take place Wednesday March 20 th at 9:30 AM in Classroom #1 of the Fellowship Hall. All ladies and friends are encouraged to attend this study and fellowship opportunity. The property committee is looking for help with mowing and trimming the grass on the church campus. If you are interested in helping with this work, please contact the chairman of the Property Committee, David Dahl . Your help would be greatly appreciated. but your need is private, and you don't want your name publicly posted in this eLink? There are now 'Prayer Cards' in the pew rack which can be filled out and placed in the offering plate. What happens then? Your request gets passed along to HLC's small confidential prayer team and Vicar Katie. In life's difficult times (we all have them), know that HLC isready to lift you up in prayer. You can also email Vicar Katie directly. We have sign-ups available in the Narthex for all positions on one sheet. The electronic method is also available. You may also email the office if you wish to put your name on the sign-up. The sign-up book is for acolyte, cantor, greeter, lector, communion assistant, altar guild, head usher, flowers, sound booth and munch 'n mingle. Will you help us with keeping this list current and pertinent? Email the Office for updates or deletions from this list. Dorian & Efraim Brandt ; Bowen David ; Stacie Welch ; Lana Guckian , niece of Christina Pompa; Christine Donoghue , sister of Heather Duewer; Wayne Erickson ; Steve Robles Jr. ; Greg Almquist ; Tonya Cermeno ; Weldon Zimmerman ; Chris Harris ; Wyatt Krueger , great nephew of Jill Johnson; Bobby O'Rear , friend of Connie Seigmund; Darlene Rydell ; Tommie Barrera , mother of Catherena Rydell; Jackie McGary ; Barbara Kinneman ; Nathan Pompa , grandson of Dennis & Christina Pompa; Storm Britten-Llouno ; Doug Nelson , brother of Sharon Holman and Nancy Johnson; Shery Fincher ; Karen Bryant ; Curtis Wahrmund ; Linda Wahrmund; Eddie Hayden. 23 rd The next monthly breakfast will be Saturday, March 8:30 - 11 AM. Every Saturday. Volunteers need to arrive between 8 and 8:30 AM to help prepare the Pantry for the community. There are two forms that will need to be filled out upon arrival if you have never volunteered before. Please see the leadership at the front desk to get them. If you would like to join the HLC Hand Bell Choir and be a part of this beautiful music ministry, please contact Glynda Vanecek by clicking on her name to send an email. If you would like to join the HLC Vocal Choir, please contact Barbie Johnson. The vocal choir practices every 2nd and 4th Sundays immediately following worship in the Sanctuary. Please join the quilters on the 1st and 3rd Sundays at 1 PM in the 502 Ministry Center as they continue to create those amazing quilts! Please contact Donna Fowler for more information. O God, eagerly I seek you; my soul thirsts for you. 1 lb. bags of beans, 1 lb. bags of rice Jelly, canned fruit, canned meats (chicken, Spam, tuna etc. ), bar soap, spaghetti, pasta sauce, mac & cheese, boxed side dishes, canned vegetables, ravioli/spaghetti-o's, shampoo, body wash, laundry soap, toilet paper. Vicar Katie is normally in the HLC Office Monday thru Thursday from 9 AM until 4 PM (except Tuesday morning when she is at Baked'n Sconed from 9:30 til 11 AM). Although these are her normal hours, she is sometimes out of the office on HLC business such as visiting shut-ins and hospitals or other meetings. Your are free to drop in, however it is recommended you call to be sure she is in. Regular office hours are Tuesday thru Thursday from 9 AM until 1 PM. Reach the office by leaving a message on the Church phone (512) 759-2064. 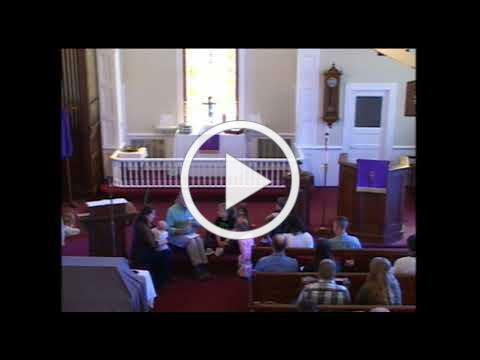 Lessons and Sermon from this past Sunday, March 17 th. Second Sunday in Lent .